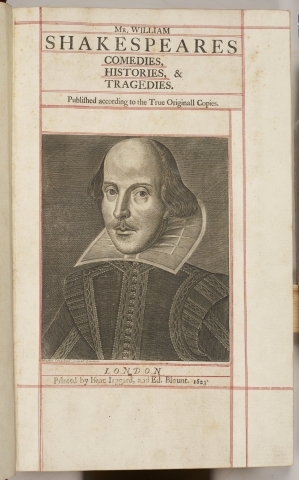 A new exhibition Shakespeare in the Royal Library, running from 13 February 2016 to 1 January 2017, celebrates the connections between the royal family and Shakespeare through the collections in the Royal Library and elsewhere at Windsor Castle. Many of the royal family’s wonderful objects are on display for the first time, and they tell stories of many monarchs who have been interested in Shakespeare, as well as the sometimes political uses to which his plays have been put in the hope of increasing popularity. The exhibition is so rich that I’m going to be writing more than one post about it, but this time I am going to look at a few objects that bear witness to the eighteenth and early nineteenth centuries, when the monarchy was not universally popular and Shakespeare was used by them as a confirmation of their patriotism. A love of Shakespeare showed that the royal family were British, and worthy of the loyalty of their subjects. At the end of the eighteenth century the royal family were often disliked, as shown by the number of political cartoons that made often cruel fun of them. And none was more often lampooned than the Prince of Wales, Prince George who was to become the Prince Regent in 1811, and King George IV after his father’s death in 1820. Prince George was known mostly for his dissolute way of life, obesity and extravagance, which his father, the unfortunate and often deranged George III, strongly disapproved of. The Prince was also a very cultured man, speaking several foreign languages and patronising the arts. The Duke of Wellington described him as “the most extraordinary compound of talent, wit, buffoonery, obstinacy, and good feeling”. The Royal Pavilion at Brighton is the most obvious expression of his love of the exotic in design, though he also remodelled Buckingham Palace and Windsor Castle itself. He also was responsible for building up the Royal Library at Windsor. But George’s flamboyant lifestyle earned him the dislike of many people and harmed the prestige of the monarchy as a whole. George’s love of Shakespeare was genuine, but he was also able to take advantage of the fact that Shakespeare was the quintessential Englishman, the source of many virtues. In the exhibition is a copy of Shakespeare’s First Folio from 1623 which George bought and had rebound in burgundy goatskin. 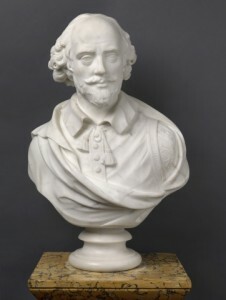 George also acquired the white marble bust of Shakespeare made by John Cheere (1709-1787) that is in the exhibition. He intended it to be placed in the Grand Corridor at Windsor Castle, but its home for over a century has been the Royal Library. As Prince of Wales he visited Stratford-upon-Avon in 1806, staying at the White Lion in Henley Street almost next door to the Birthplace. His signature appears in the Visitors Book to the Birthplace in 1815, but this was judged by local attorney and historian Robert Bell Wheler to be one of the “fictitious names…abundantly inserted in that and in all other albums”. George became Prince Regent during one of his father’s periods of mental breakdown and it was during this time that the long war with the French ended with the Battle of Waterloo. The BBC History page on him explains how the national mood changed after this event: “He was able to indulge his love for parades and spectacle after the final defeat of Napoleon by Britain and her allies in 1815”. It is surely not a coincidence that the tradition of holding a parade to celebrate Shakespeare’s birthday began at this time of rejoicing, in 1816. In 1820 there began a project to build a memorial to Shakespeare in Stratford-upon-Avon, to which the Prince (by then the King) pledged £100. Although it had royal approval and many donations from the nobility the proposed mausoleum never came to fruition. Instead the more home-grown Shakespeare Club was founded in 1824, and in due course the King was petitioned for support. He had adopted St George’s Day (also Shakespeare’s Birthday) as his official birthday, and early in 1830 he gave his approval to the Club which then became known as the Royal Shakspearean Club. It had been hoped that he would be able to visit the town for the Celebrations, but he was dangerously ill and died just a few weeks later. We now think of Queen Victoria as a highly respected monarch, but one item in the new exhibition is a reminder that this was not always the case. Early in her reign there were complaints in the press that she favoured plays and operas from abroad. In order to improve the Royal family’s standing with the public, Charles Kean’s company from London was invited to perform at Windsor Castle each Christmas, with the focus on British plays, of which a major part would be Shakespeare – nothing could be more patriotic. 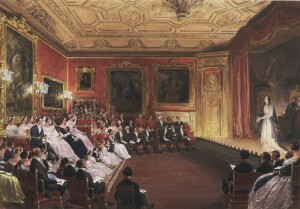 The picture showing the royal family enjoying one such event was commissioned by Queen Victoria in 1853 from the artist Louis Haghe. Onstage Mrs Kean plays Lady Macbeth in the sleepwalking scene, and on the left can be seen the Queen, Prince Albert, members of the nobility and the royal children. It’s a great piece of propaganda for the Royal family as well as a record of a notable event. Victoria and Albert’s admiration of Shakespeare, though, was real: it is recorded that they attended many performances of Shakespeare plays at London theatres, and invited actors to perform in private at Osborne House on the Isle of Wight. This entry was posted in Legacy, Stratford-upon-Avon and tagged Charles Kean, Duke of Wellington, First Folio, George IV, John Cheere, Louis Haghe, Osborne House, Prince Regent, Queen Victoria, Royal Library, Windsor Castle. Bookmark the permalink.